Years ago once I discovered a few health issues that had been causing fatigue, weight gain and aching joints I was put on a somewhat restrictive but extremely healthy diet by my Naturopath. In the process suddenly my little gray hairs started to grow out darker, my skin was super clear, line free and glowing and my energy level began to rise again. Of course one would think that this miracle diet would be something that I would stay on forever, but alas… I admit I am weak. I can’t always resist a bowl of pasta, a plate of salsa verde’ enchiladas or dark chocolate brownie so falling off the clean eating wagon is often easier than climbing back on. But I recently came across a great book that makes it relatively painless to achieve smooth glowing skin, a slender figure, shiny hair and abundant energy. Having done loads of research on how diet affects the body, mind and spirit I can honestly say that this book culminates several methods that can turn back the clock and lead you in a healthier direction. Plus Kimberly Snyder the Author has a slew of A-list celebs clients that follow her program religiously including Drew Barrymore, Fergie, Channing Tatum and Hillary Duff. 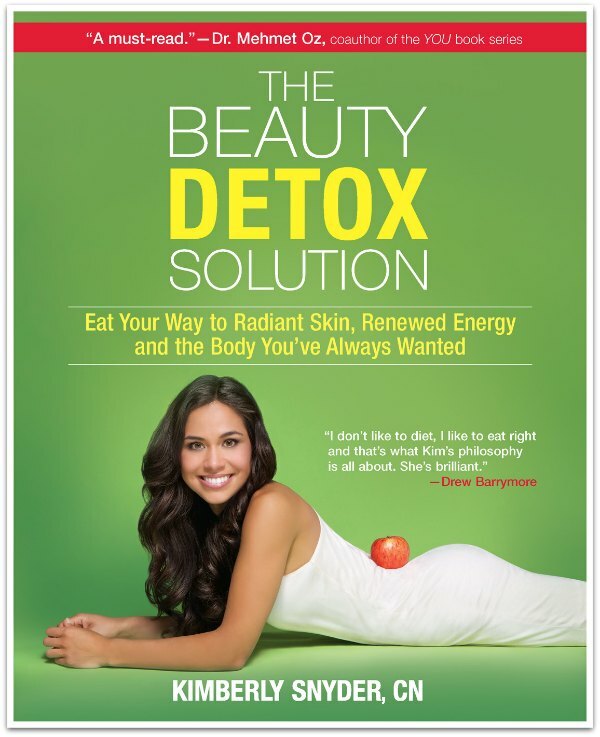 Kimberly Snyder’s The Beauty Detox Solution: Eat Your Way to Radiant Skin, Renewed Energy and the Body You’ve Always Wanted is a no-nonsense approach that’s easily tailored to any lifestyle, where she explains how anyone can follow her three-phase program to look better than they ever thought possible. By adopting Snyder’s approach to health and beauty, anyone can reap the benefits of cleansing their system: weight loss, radiant skin, lustrous hair, and better overall health. Having helped many A-list celebrity clients obtain their optimal health and beauty, Kimberly now shares the secrets of her revolutionary—but simple—plan for cleansing the body of unhealthy, age-inducing toxins for a younger, healthier, and more beautiful you.